Home Science & Tech New 12-inch Macbook: Rose Gold or Fool’s Gold? 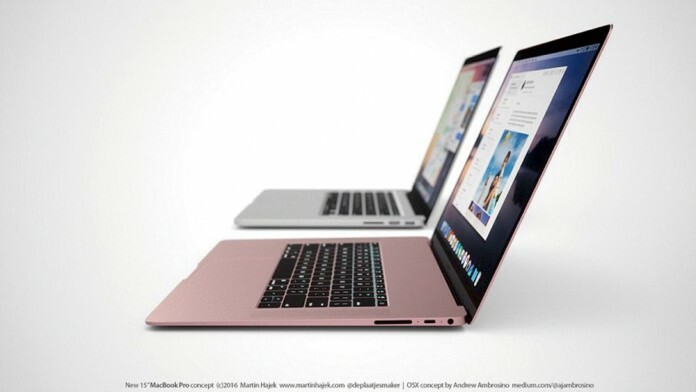 New 12-inch Macbook: Rose Gold or Fool’s Gold? Apple introduced their updated MacBook on April 21 with improved hardware, better components and the color option of the popular rose gold. The improved notebook sports a clean and polished look, with an emphasis on portability and style without skipping out on performance. This year’s product improved on the shortcomings of its predecessor such as battery life and hardware, making it a standout option for anyone looking for a reliable notebook for general computing. The 12-inch MacBook’s strengths start with its Retina display. Apple has engineered a 2304 x 1440 pixel display onto a 12-inch screen giving users a visually pleasing experience when watching YouTube videos or movies, even if they’re on a smaller-than-average screen size. The Retina display that Apple prides itself on does not disappoint, as its vibrant colors and bright LED backlight make for surprisingly high-quality display on such a small form-factor. As expected, the new MacBook has taken a step up from the past model in hardware, with options for the Intel Core M3, M5 or M7 processors for faster computing from basic computing to running intensive apps. Partner this with 8 GB of memory and flash storage, and there shouldn’t be any trouble doing even the heaviest of tasks on the MacBook. The cherry on top is the 10-hour battery life, which really confirms the MacBook as a top-of-the-line notebook in terms of productivity. Apple has also claimed to have improved their internal components, as their website advertises custom-shaped components to fit in and take advantage of all the corners and space of the MacBook in order to provide the most performance. This has allowed for force touch to be implemented on the MacBook, so users familiar with the iPhone 6S can use the same gestures to navigate around the MacBook’s interface. Even with such great focus on portability and performance, the MacBook does have drawbacks. One of the disappointments of the MacBook is its USB-C port. Although it stirred outrage last time, Apple has decided to put their foot on the ground in terms of this one. The Macbook only comes with one universal USB-C port, which means that users cannot use their charger and USB at the same time without the extension dongle. This feature, or lack thereof, is sometimes a deal breaker to many potential buyers because of the lack of options, such as using a mouse, external display or multiple USB ports. Additionally, a luxury laptop comes with a luxury price tag. Starting at $1299, the MacBook offers great general computing aspects and a style that will appeal to users prioritizing portability and simplicity, but it does not meet the standards in terms of features and performance for its price point.